On January 22, a five-week learning lab will kick off to help local professionals and business owners refine their speaking and presentation skills-particularly those who don’t “love” public speaking! Expert speaking and presentation coach Barrie Barton has helped hundreds of individuals become more confident and skillful speakers. Barrie’s supportive and engaging approach can help you overcome your fears and step into your confidence! Shift from Fear to Excitement and Readiness! 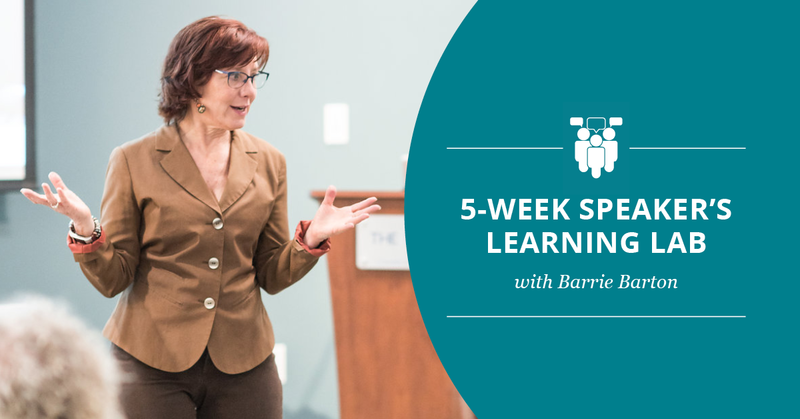 In the Speaker’s Lab, Barrie will maximize each weekly 90 minute session with guided lessons on delivery and content development while keeping the “painful” process of overcoming the fear of public speaking fun! Learning Lab attendees will be guided to generate well-organized content and be coached to present a signature message to an audience. You will also receive weekly coaching and support! In addition to overcoming your fears, as a result of the Speaker’s Lab, attendees will receive real life tactics to write, rehearse and deliver their first fantastic presentation. “Barrie’s mastery of engaging with her clients and then helping us cultivate our presentations equals guaranteed results.” – Melinda Tomey, M.D.